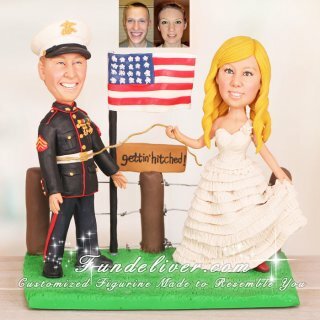 This is a completely customized gettin' hitched country and military theme cake topper ordered by one of our customers. Their desire for their wedding is to combine a Texas country theme and a military theme. They plan on having black, white, red and yellow as their color scheme to go with the Marine uniform. 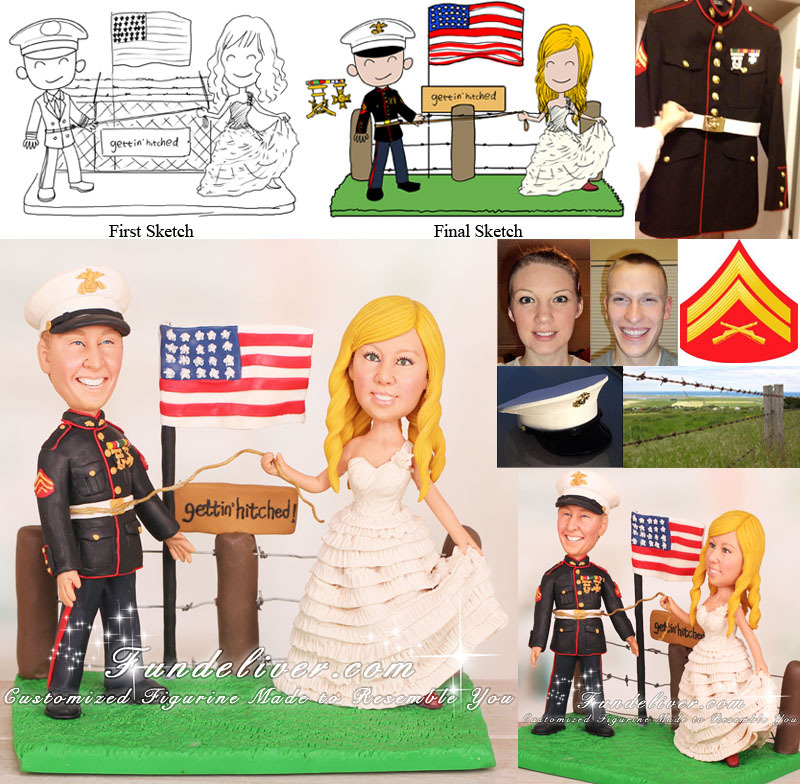 Their dream wedding cake topper includes the groom, who is a corporal in the Marine Corps, in his complete dress blues uniform. The corporal's uniform has two chevrons on the sleeve, a red stripe down the sides of the pants, and includes the white hat. The would like the bride, a small town country girl, in her "sleeping beauty" wedding dress by Alfred Angelo, her long curly blonde hair, and her red and black cowboy boots. They want a barbed wire fence in the back with a raised American flag and a wooden sign in the front reading "gettin' hitched!". They would really love the sculpture of the bride to be holding a rope that is lassoed around him with one hand, and the other holding part of her dress up showing off her boots.